Okemo volunteers Sarah, Heather, Dan and Michelle collect food from skiers at the Okemo base lodge on March 29. LUDLOW — On Sunday, March 29, Okemo held their annual Cares and Shares spring food drive. 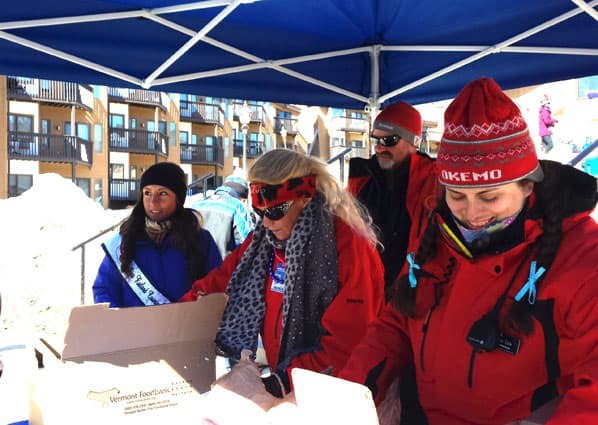 On a beautiful Sunday morning, Okemo Mountain Ambassadors helped collect nonperishable food items and cash in exchange for discounted lift tickets. Altogether, skiers and riders donated over 60 boxes of food for the Black River Good Neighbor Services (BRGNS) food shelves and a substantial amount of cash. Twice each ski season Okemo holds the food drive, which gives skiers and riders a significant discount on a ticket price in return for a few cans, jars or boxes of food. Black River Good Neighbor Services operates the food shelf all year for residents of Ludlow, Cavendish, Plymouth and Mount Holly. It also operates a thrift store to defray the cost of the food shelf and other assistance programs.